Sandra Paetsch has always been creating. She began by sewing doll clothes and 40 years later a gift of Hawaiian jewelry stimulated a new career. “I was intrigued with the stones and the how the necklace was made,” says Paetsch. “It inspired me to purchase jewelry making tools and create some pieces.” She soon developed an entire collection and formed Orange Avocado – an homage to her daughter who loved oranges and son who loved avocados. Her line of jewelry has been so well received by the community that Paetsch quit her job as a speech-language pathologist to focus on Orange Avocado full-time. Image: More Love. 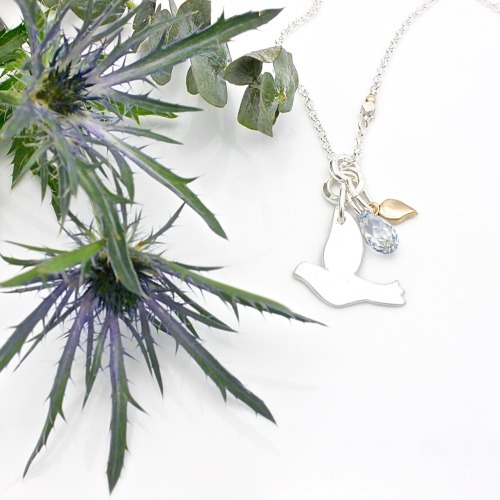 Dove Charm Necklace - silver, Swarovski crystal and bronze. Paetsch’s handmade jewelry combines classic modern design with natural and organic elements. Her pieces are largely composed of fine silver and bronze metal worked pieces with a sprinkling of semi-precious stones. “I make each collection cohesive and very different from the previous collection,” says Paetsch about designing her seasonal themes. Collections have explored the Cubist movement of the early 20th century as well as studies into shape, form and texture. Paetsch has also been involved in various philanthropic ventures, creating custom pieces to support Sorrentino’s Compassion House, Wings of Hope Breast Cancer Foundation, the Find Azer Kids Now Organization, and The Zebra Child Protection Centre. She feels her success is linked to our city. “I love everything about Edmonton: the landscape, the people, the opportunities,” says Paetsch. “I feel very lucky to be part of a city that embraces the handmade revolution and is so supportive of small businesses and local handmade goods.” She references the many venues available to local Edmonton artists to display their creations – local craft shows and boutiques, like TIX on the Square. 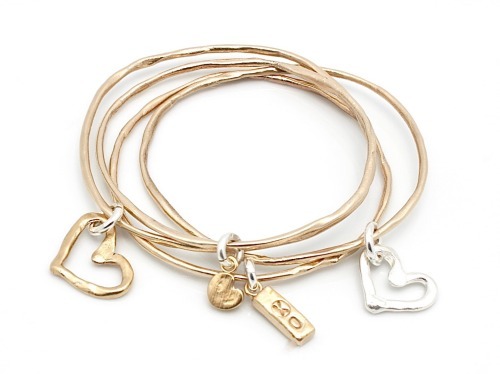 Image: hand formed bronze bangles with silver and bronze charms. Image: Arctic Blossoms Collection featuring layers of fine silver, gold and bronze. You are a not only a creator but you are a business. Follow Orange Avocado on Instagram, Facebook, Twitter and Pinterest. Any follow up questions? Fell in love with her work? Want to possible get a sneak peek at the new Arctic Blossoms collection? Make sure to come visit Sandra at our Holiday Open House, on Nov 18 from 10 am to 4 pm! You can head here for more info!